In computer science, garbage in, garbage out (GIGO) describes the concept that flawed, or nonsense input data produces nonsense output or “garbage”. The principle also applies more generally to all analysis and logic, in that arguments are unsound if their premises are flawed. As a libertarian I used to believe some pretty crazy things. I believed that a dollar was something you worked for, for one. A dollar is a debt instrument that every business in the United States is required to accept as payment. It is not a measure of hours worked or effort expended. You don’t work for dollars, you have to have dollars to pay for the things you need or want. You trade effort or hours for dollars if you are a working stiff in the modern age. If you have dollars you make the dollars work for you to create more dollars. This is a subtle but important distinction, one that anyone who desires excessive wealth should take to heart. Similarly I believed, and most libertarians still believe, that freedom of speech meant you had to listen to every idea equally. Give every idea equal weight. This crazy notion is not limited to just fringe political groups, it has been embraced by a very large portion of conservatives and Republicans, and even American liberals don’t understand some of the finer points of what the first amendment, freedom of speech, means. The problem with continuing to listen to bad ideas is that each successive generation receives those ideas as if they are all of equal value. This position is obviously false. Some ideas are incorrect. The world is not flat, it is visibly curved to any observer who cares to study the subject. The Earth, her moon, the other planets and their moons, etc. all move in mathematically predictable ways around the sun. We do not have to prove to each successive generation of human beings that the Earth is not the center of the universe. We need simply show how we know the Earth is round, the sun the center of a solar system, for them to grasp the math involved with these correct observations. These are factually demonstrable truths that do not have to be viewed equally with the Ptolemaic system, requiring each successive generation of human beings to determine which finding is the correct one. Learn a little math, do a few observations, yep, that confirms the heliocentric model. Onto the next thing we have to learn. Not all truths are as obvious as the basic findings of astronomy, and even those findings are not universally embraced by all modern humans. There are a few disturbed people out there who still think the world is flat, and we don’t let those people run NASA for a reason. That reason? Because their denial of science disqualifies them from leading a scientific agency. They fail the test of expertise, another demonstrable truth. There are things that experts know that the layman does not. I know things about CAD systems and architectural detailing that would bore the pants off of anyone who isn’t enamored of building systems and the illustration of same. That expertise qualified me to hold a high-paying job in the architectural field once upon a time. It had real value; and expertise, all expertise, is demonstrated through that value. If you plant lima beans for a living, and you do it successfully for long enough, you become an expert on lima beans. But that doesn’t make you an expert on rocket ships. Which brings us to another truth. Expertise is limited in scope, and the farther outside your expertise you venture, the more likely you are to be wrong in your beliefs. This is the Dunning-Kruger effect in a nutshell. Everyone believes they know more about subjects that they are not experts in than they actually do. This is why a brain surgeon isn’t a good candidate to run a poverty program. The fact that Ben Carson successfully navigated a hierarchy as complicated as working in a hospital presents is probably the only reason he still has his cabinet position. He knows how to keep his mouth shut when he needs to. When he has a job to do and isn’t campaigning. He knows the value of expertise and he doesn’t visibly contradict the experts around him who know things about the department of Housing and Urban Development. When the Republican party formed back in 1854, the value of expertise was understood. With little else to distract the population in the way of entertainment, politicians and pundits would debate for hours in front of huge crowds, working and reworking the issues of the day. Abraham Lincoln was an expert at navigating the treacherous terrain to be found between openly advocating for the abolition of slavery, and allowing slavery to encroach into the Northern states that hated slaves and slavery for what it did to the lives of average men. Hated slavery for the degrading poverty and dearth of industry in the South that slavery imposed on the economy of the South. The Lincoln-Douglas debates featured his abilities to master the subject, a success that eventually snagged him the nomination of the Republican party and through their growing influence, the presidency of the United States. He then expertly managed to conduct the the office of the presidency, successfully, while maintaining a war with half of the original republic, and at the same time engineering the largest change in civil society, the abolition of slavery, that the United States had seen in its short 75 years of existence. Had he survived his time in office, had he not been felled by Southern hands and succeeded by a Southern sympathizer, many of the problems that we wrestle with today would never have manifested in the first place. That was the master politician that Abraham Lincoln was. That was the kind of organization that the Republican party was when it was progressive and liberal and on the right side of history. 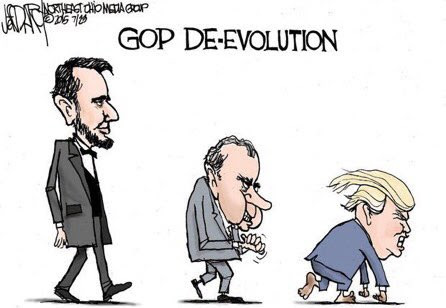 From Lincoln to the Orange Hate-Monkey in 150 years. That is what the Republican party gained from not understanding that there were real, actual truths underneath all the political posturing. That science and expertise have real, demonstrable value. GIGO or Garbage In, Garbage Out has taken its toll on the GOP and rendered it the political organ of a would-be fascist. A would-be fascist whose political supporters want to enact a racial cleansing on the United States. The party that ended slavery has become the party of the inheritors of slavery’s stolen wealth. The irony is almost rich enough to laugh at, if the fate of the world didn’t hang in the balance, and it does currently hang in the balance. It hangs in the balance because Vladimir Putin did work to get Donald Trump elected as president. He worked to get Britain to embrace Brexit, and his troll farm is still actively attempting to subvert political processes in the United States and all across the world. He is seeking inroads to power wherever he can find them, and right now the internet is his tool of choice. All information on the internet is now suspect. Nothing can be taken for granted. Every platform, every system, every piece of information technology can now be possibly subverted by criminal actors attempting undermine the great advances that have been made in the world, and they are doing this with the technology we, the West, invented. On Thursday, President Trump flew down to McAllen, Texas to push his pro-wall, anti-immigrant narrative. This week, On the Media examines how the community tells a more welcoming story about the border — and a dogged presidential fact-checker joins us to pick apart the Oval Office address. Plus, how some progressives used Russian election interference tactics against a right-wing senate campaign. Also, is everything online fake? Make no mistake, we have made great strides toward improving equality across the world. In between the war profiteering and other boondoggles embarked on by the powers that be in Washington DC, the technology we created has moved out of the United States and improved the lives of people everywhere. So much so that poverty in the world is the lowest that it has been at any point so far in history. But the spreading of information and equality through technological systems has opened the doors for misinformation and distraction to be spread in the same way, through the same mechanisms. Political bias, racial bias, religious bias. All these things still exist, and all these things are corruptions of the truth. They are weaknesses that the power-hungry can exploit in order to gain more power. That is what Vladimir Putin has done in Russia by re-establishing the Russian Orthodox church. He gives ethnic Russians a thing to believe in now that the dictatorships that liberated the Russian people from Czarist rule have fallen. He foments friction at the edges of his political empire, his fake republic, and exploits the resulting distrust by seizing land belonging to neighboring nations, by re-asserting old Soviet alliances. His neighbors fear him, which is what he wants, and his old foes are confused, fighting among themselves. All by his design. The first thing we need to do, if we want to oppose this new criminal oligarchy founded by Vladimir Putin and embodied in his paid-for stooge in the White House, is to know who it is we are fighting, why we are fighting them and how we intend to win this fight. The first casualty of this information war has to be the ability to promote falsities as truths. If we can’t even determine what is true and what is false, then we have already lost the war. Garbage In, Garbage Out. If we believe what we are told by others with no need to verify what is true, we are sheep lead to slaughter. Subjectivity is the enemy. The people we are fighting are liars. Charlatans. Confidence artists. People who say things we want to believe but which are not demonstrably true. Many people cite this quote, few understand it. To be eternally vigilant is to practice due diligence as often as required when it comes to the things you believe as well as the things you are told. What is due diligence? Caveat Emptor. The two states of mind are interchangeable. Healthy caution and skepticism. If you want to be at liberty, if you want to maintain liberty, then you must be skeptical of all things that are not immediately apparent. As an example. Freedom of speech is not free. You cannot say whatever springs to your mind and expect to suffer no consequences. This is what most people think freedom of speech means. Speech without consequences. All speech has a cost, in that you may be held accountable for the results of the words you speak. This is why you are punished for causing a panic by yelling fire! when there is no fire. It is not the speech that is punished, it is the result of the speech. The cause of the harm was speech if anyone was harmed in the resultant panic. No harm, no foul, as the adage goes. But how do you assess harm? Is all harm readily apparent? If you are not harmed by a person’s speech, but your neighbor is, should you care? What if your neighbor is a different race? A different religion? A member of a different political party? Insert Niemöller’s law here. That way lies death. So harm, even delayed, indirect harm, should be guarded against. And that, dear reader, is the quandary. As I noted on my last article about Alex Jones, deplatforming is not censoring a person’s speech. All these people claiming they have been censored by social media have their own websites. They have just as much access to consumers as any other individual in the system has. They simply do not have a megaphone through which to spread their lies. We are fighting an information war here, and the first thing that has to go is information which is demonstrably false. Kicking ethics violators off of Twitter and Facebook is not censoring them, it is applying objective rules to subjective life. This is necessarily a messy business, but then bad people do exist. Bad ideas do exist. Stupid people do exist, and they don’t know the difference between a good idea and a bad idea. This requires things like rules of order (Robert’s Rules) parliamentary procedures, etcetera. Objective ethical standards have to be in place and they have to be enforced so that ideas can be properly tested and debated. You cannot call for harming another person and not expect the platform from which you speak to be taken away. That is simply good information hygiene. Any platform which doesn’t distinguish between good (correct) and bad (incorrect) information is a platform which is doomed to be dominated by the most ruthless, because it is the ruthless people who have no boundaries. Ruthless people do not worry about harming others to get their way. Lies. Fraud. These are but tools in the hands of the ruthless. Does deplatforming cause them harm? Only if they subjectively deem that their lies bring them power. In that case they don’t need a platform, they need a therapist. Any platform created to be all inclusive (Spreely.com, Minds.com, etcetera) will be dominated by the most hateful. There is no way to avoid this scenario if you do not set hard ethical lines which cannot be crossed. I hope these platform providers enjoy taking orders from fascists. 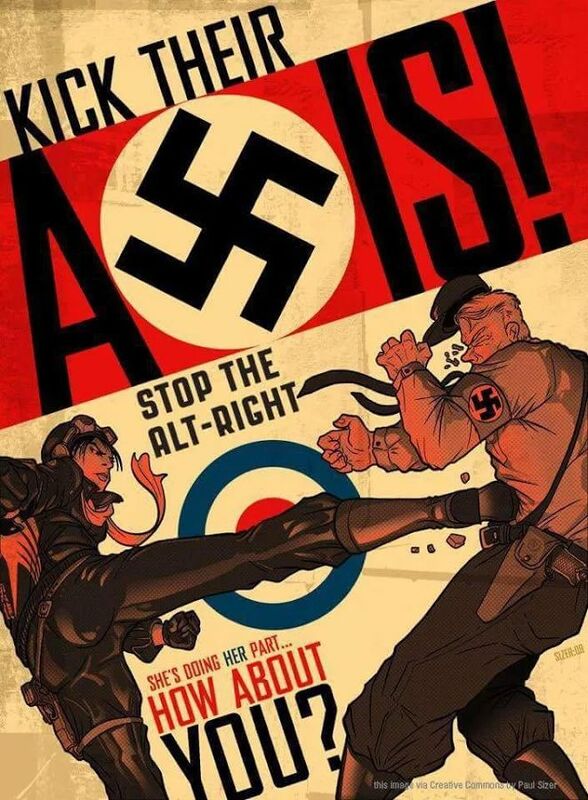 Fascists that will tell them what and how to think; which is what fascists do and why fascists (like Nazis) shouldn’t be given a platform in the first place. It is a quandary, but it isn’t an unsolvable problem. I’m still on Facebook, for now. They at least acknowledge the existence of incorrect information and harmful social interaction. I’m not happy with providing a platform for ideas designed to kill me. I won’t spend time on a social platform that allows them space to spread their lies. Consequently those who voice views about political purity, religious purity, racial purity, promote the lie that life is a zero sum game that requires I harm others to win, these kinds of people and beliefs are not welcome anywhere that I am expected to be. I would ban these people myself. I do block and report these people when I’m given the tools to do so. Authority might be necessary, but authority need not lead to authoritarianism. The difference between allowing Donald Trump to take office because existing mechanisms put him in position to assume that office, and not allowing Caudillo Trump to violate the law in the name of his whims or his stormtrumper’s whims is exactly how that ethical hair is split.